Street children or street urchins are homeless children who live on the street – in particular, those that are not taken care of by parents or other adults. Street children live in abandoned buildings, containers, automobiles, parks, or on the street itself. That is in contrast to children that are homeless that are living in shelters or taking refuge with friends or relatives. Below are a few pictures of street kids taken by various photographers around this country who have posted them under a creative commons license. “According to a recent statewide survey of homeless people in Minnesota, conducted by the Wilder Research Center, for most youths, going back to live with their parents is not a viable solution. Their homeless plight started as a result of their parents. Fearing their chemically dependent or physically or sexual abusive parents, many youths would rather endure the life on the streets than return home. Many have already lived in foster care, detention or treatment centers. Five times more likely to have been treated for alcohol or drug problems, although homeless youths are half as likely to report current use of alcohol. More than three times more likely to have been hit by a date or intimate partner. For girls, 20 times more likely to have been pregnant; for boys 10 times more likely to have had a sexual relationship that resulted in pregnancy. 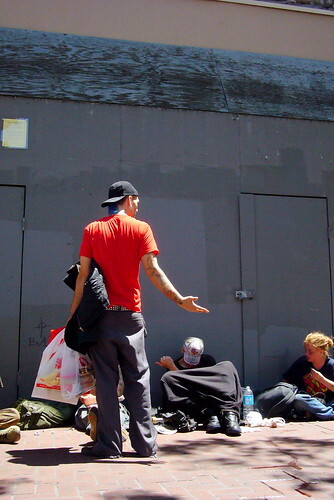 Youth of color are three to four times more prevalent among the homeless. Come ON folks, these could have been your kids. Find a way to help.